A lemon meringue pie is a showstopper, but its splendor is usually short-lived. If you prepare this tangy dessert even a few hours in advance of serving, you risk a topping that's shrunken, weepy and chewy instead of light, airy and fresh. The pie is simply at its best when freshly made. If you find yourself with leftovers, they aren't a complete lost cause. Storing a lemon meringue pie requires strategies that begin when you prepare it. A purchased pie may also be successfully stored. Don't expect the stored version of either to compare to freshly baked, though. Weeping, when beads of moisture form on top of the white meringue, occurs when the meringue and topping are overcooked, or the meringue is made with old eggs or is over-beaten. Meringue weeps more readily when refrigerated as the atmosphere causes it to release moisture. A humid climate also hastens the degradation of meringue topping. Keep your pie pristine by adding the meringue as close to serving time as possible. Avoid placing it in the refrigerator, unless you are storing it overnight or longer. 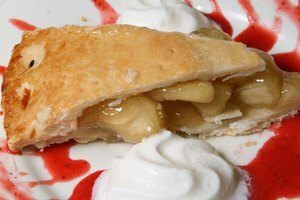 A way to store the pie is to bake the crust and filling, then store this incomplete pie in the freezer or refrigerator. Prepare a cooked meringue separately from the pie and add it just before serving. This procedure creates a more stable topping and is easier to do than you might think. Simply combine the egg whites and sugar in a double boiler over medium heat. Once the mixture is warm, remove it from the heat. Add cream of tartar to provide more strength and resilience to the meringue and beat into stiff, glossy peaks. If the peaks turn from glossy to matte, chances are the meringue has been over beaten. Mountain meringue over the baked pie so it touches every edge of the crust. Add just a teaspoon or two of cornstarch to the meringue mixture as it warms in the double boiler. The cornstarch helps absorb some moisture and discourages weeping, even when the pie is stored. Run the pie under the broiler for a minute or two with the pre-cooked meringue to create a toasty brown topping. 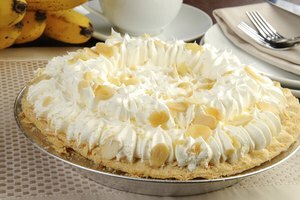 The baked pie without meringue may be frozen for up to three months before adding the topping. Simply wrap the cooked pie, still in its tin, in several layers of freezer paper and lay flat. Remove the wrapping and allow it to thaw before you add the topping. The meringue must be cooled completely before being added, too. Both the filling and topping should be room temperature. Warm topping on a cold filling tends to create a small pool of water between the layers so that the meringue may slip off when the pie is sliced. Leftover pie keeps better in the refrigerator, but you may still experience a change in meringue texture. Cool the pie completely before storing. 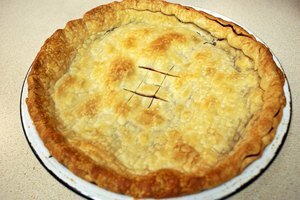 Tent the pie loosely with foil -- never plastic wrap, which encourages moisture development. The leftovers will keep for approximately three days. 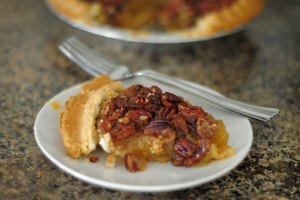 How Do You Store Pecan Pies in the Refrigerator?